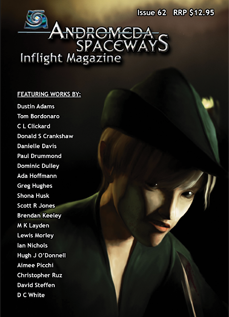 Issue #70 of Andromeda Spaceways Magazine out now! *Both mobi and ePub files are compressed as .zip files and will need to be unzipped. 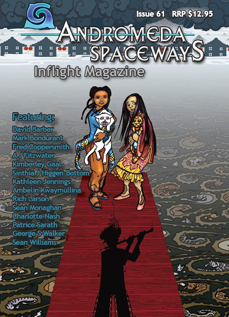 Andromeda Spaceways is proud to announce the arrival of issue #62 of our Inflight Magazine. 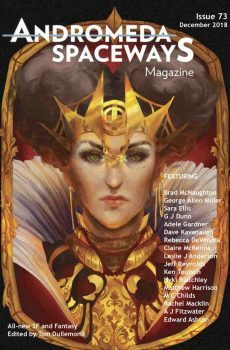 We’ve got a fantastic selection of stories that include talking dogs, genies, football-loving leprechauns, sunken treasure, ice-planets and much more including an interview with Australian author Isobelle Carmody! So run to the docking bay to get your copy! ASIM #61 has arrived on the launch pad, packed with fiction, poetry and nonfic from David Barber, Mark Bondurant, Fred Coppersmith, A J Fitzwater, Kim Gaal, Sinthia J Higgen-Bottom, Kathleen Jennings, Ambelin Kwaymullina, Rich Larson, Sean Monaghan, Charlotte Nash, Patrice Sarath, George S Walker, and Sean Williams. 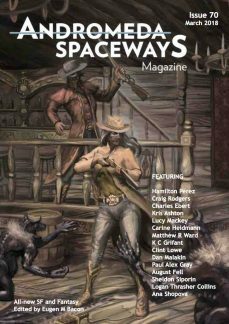 Issue #73 of Andromeda Spaceways Magazine out now!